My dad and I were at the farmer’s market this summer and he purchased the alpaca for me to knit this vest for him. I finally got around to making it. 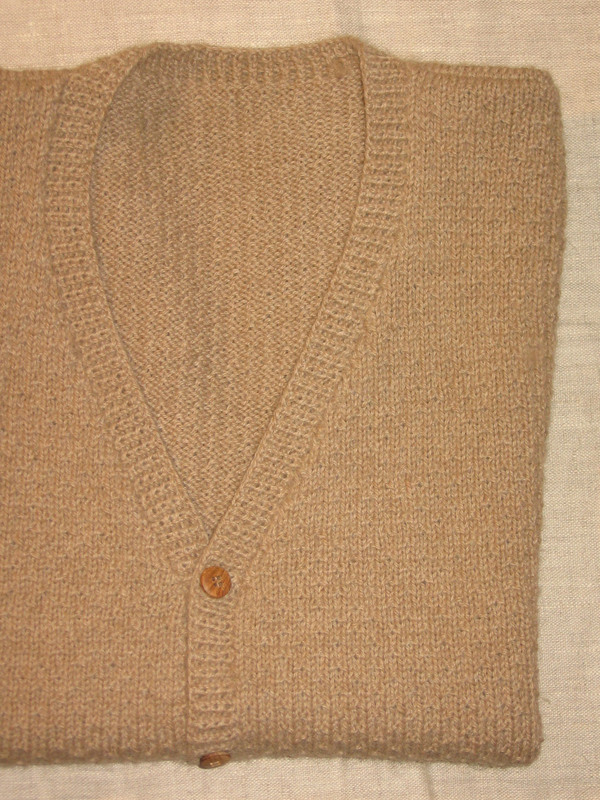 The pattern is an adaptation of a basic Penny Straker pattern for a pullover vest. I turned it into a button down vest, and added a pattern so that it was a little bit more interesting. 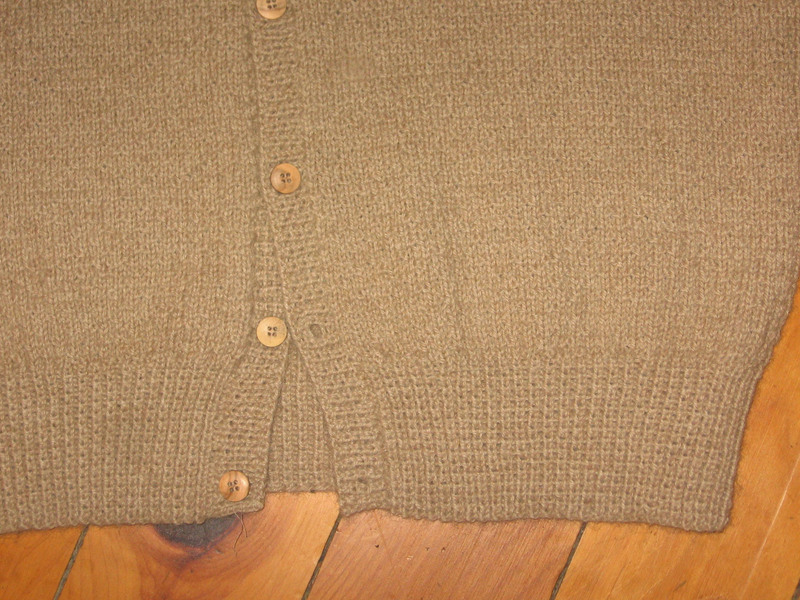 The alpaca fiber was sport weight, and I ended up knitting the vest on size 4 needles to get the appropriate gauge. The pattern is made by knitting three, purling one, for the first row. The second and fourth rows are purl (or knit if you are working in the round). The third row is knit one, *purl one, knit three, repeat from * until 2 stitches remain, knit two. The 1 x 1 ribbing at the bottom, and around the arms and front is a ‘raised rib.’ Created by knitting into the back of every knit stitch, and purling the purl stitches as normal. For the button band, I picked up three out of four stitches up the fronts, and then when the decreases started, I switched to 7 stitches out of 8. This seemed to be a good formula, and the button band isn’t too tight or too loose. I followed the same plan for the armholes, picking up one for one at the cast off edge. Without counting, I ended up with the exact amount of stitches that the pattern called for around the armhole. To finish, I sewed on little wooden buttons. I find it fascinating that materials for this vest grew in right outside of Brighton, IA, on a lovely little farm called Dutch Creek Gardens. 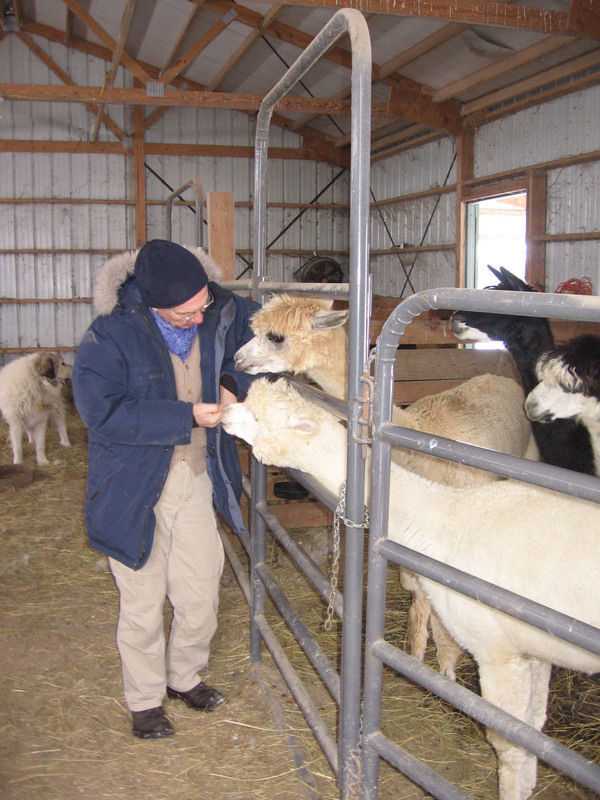 They have 12 alpacas, fruit trees, native prairie, and a vineyard. 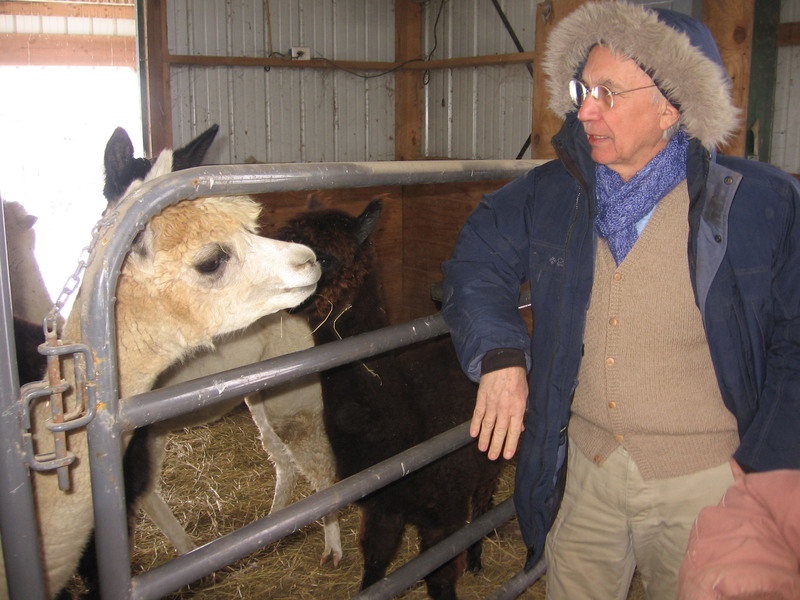 My dad and a friend and I went to the farm to visit the alpacas, and let them see the vest! Mr. Bojangles, the first alpaca we met, posing for the camera! 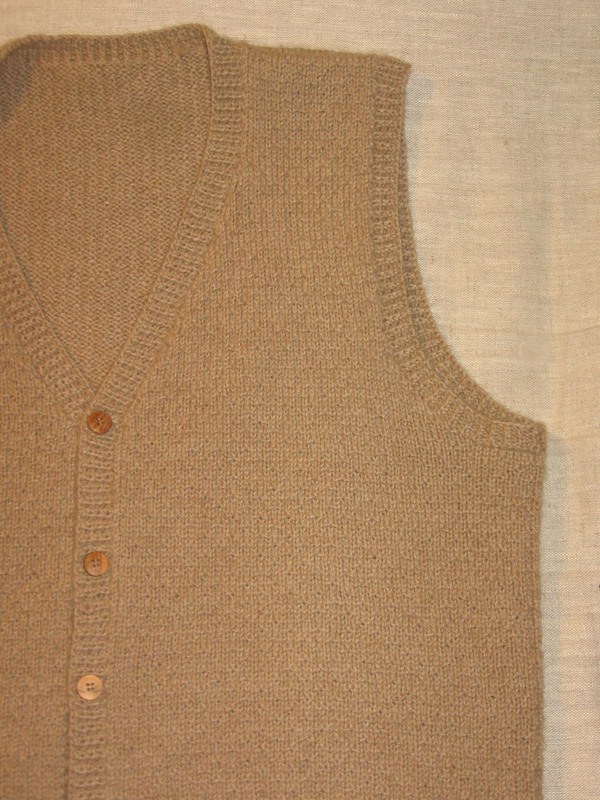 The vest was knit with fiber from Star Gazer. 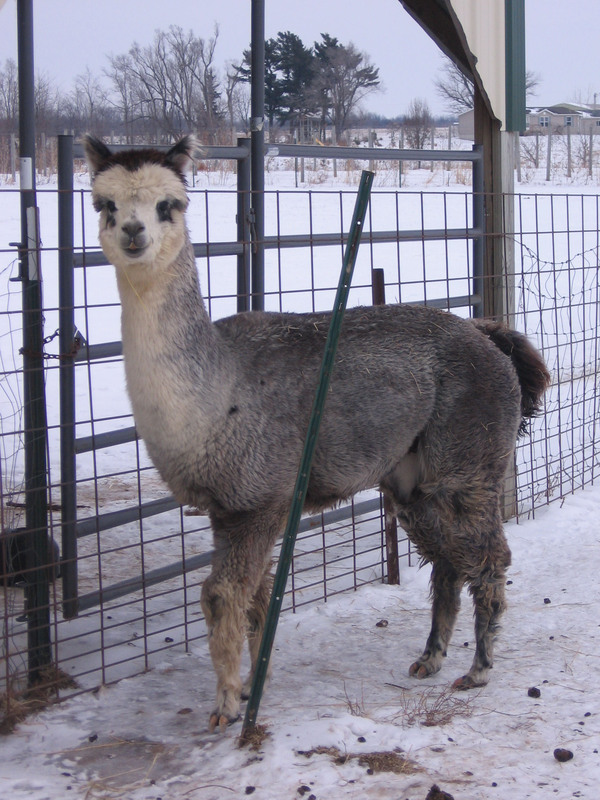 She was the first alpaca born on the farm! Here she is chatting with my dad. Talk about buy fresh, buy local! 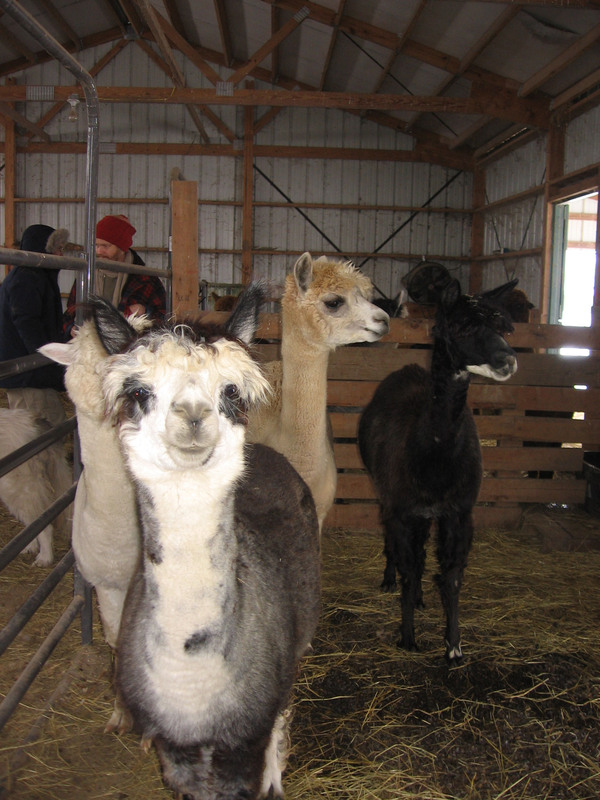 The alpaca fiber traveled to Morning Sun to be spun into yarn , and then back to the Brighton, and then to the market. Then it came home with me, and was knit into the vest. That is it! Here is my dad with Star Gazer and her baby, Morning Light. Maybe they detect a bit of alpaca. They definitely were sniffing the vest, although they might have been looking for food, as we were feeding them.. I absolutely love this!! What a great story behind the garment. I love the pics of the alpacas with your dad, so incredibly sweet! You are wonderful! Torrey, Thanks for coming over and letting me see the vest. It is quite beautiful. I hope your dad stays warm in it for years to come. Please do come back in the spring, summer, and fall. As you know from your own place, each season has its own beauty. By early summer we will have new crias to show you. If you loved the moms, you will absolutely adore the little ones. That’s a mighty fine looking vest and your dad looks great in it! Wow!! It is so cool to see you dad with the alpaca!! I wonder if the alpaca could catcg its own sent? ?